Sarah Nicholson (left-center) and Aubrey Roberts (right-center) round a turn. 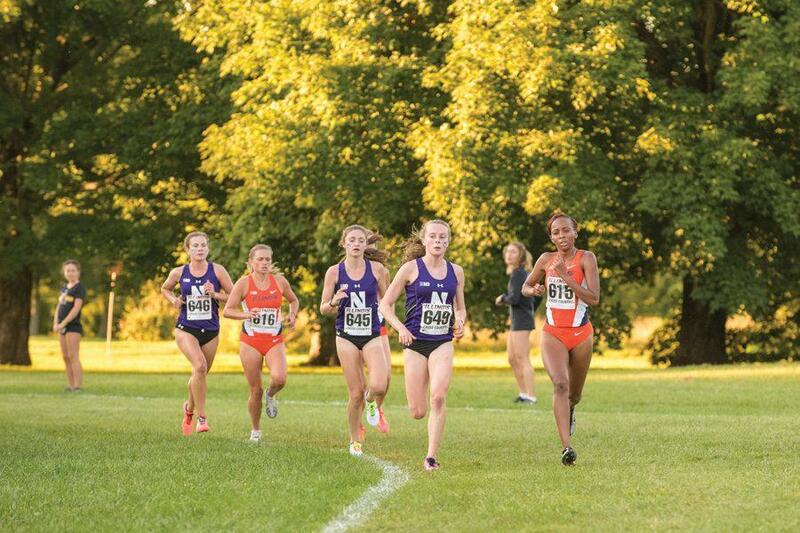 The two freshmen again led the way for Northwestern at the Big Ten Championships, where the team finished ninth overall. Injuries and illness have put a ceiling on Northwestern’s performance throughout the regular season. But at Sunday’s Big Ten Championships, the Wildcats put things together in a solid team showing. Improving three spots in the team standings over 2015’s Big Tens, NU took ninth overall, scoring 254 points, 83 behind eighth-place Indiana. It was the Cats’ best finish at the conference meet since 2012, when they took seventh out of 12 teams. NU came into the meet with a goal of climbing into the top eight, but relative to its other performances throughout the season, the ninth-place finish was a positive one for the team. Once again, freshman Aubrey Roberts led the way, finishing an impressive 12th individually. She ran the 6K race in 21:25, nearly a minute faster than the time she notched at the Griak Invitational on Oct. 24 at the same Minnesota course. Roberts got off to a strong start, sitting in the top 15 through 1K. As the race developed she hung around the lead of the pack trailing the race’s leader, Michigan’s Erin Finn, and the immediate chase group. Although she wasn’t able to close the gap, she maintained her rhythm through the ups and downs of the difficult, hilly race. The Wisconsin native was familiar with the course, having run it before in high school and again earlier in the season, and she managed the hills well en route to a spot on the All-Big Ten second team named after the meet. Behind Roberts, fellow freshman Sarah Nicholson took 29th individually with a time of 22:09. While the two freshmen gave NU a strong foundation, the rest of the Cats did enough to solidify the team’s spot in the standings. Senior Jena Pianin took 73rd, junior Isabel Seidel took 77th and junior Haley Albers took 90th to round out NU’s scorers on the day. Coach ‘A Havahla Haynes said the performance of the Cats’ third through fifth finishers was the engine for the team’s success. The overall performance puts NU on an upward trajectory following the team’s final meet before the NCAA Midwest Regional. Although Roberts and Nicholson have been a revelation this season, the Cats’ supporting cast around their two freshmen has dealt with injuries and inconsistency, keeping the team from strong finishes. Sunday’s Big Tens showing was a glimpse of NU’s potential and should be a confidence boost as the team heads into what may be its last fall meet.